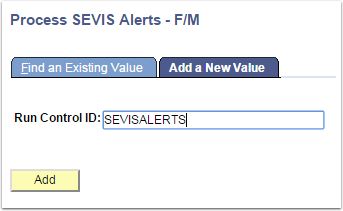 Purpose: Use this document as a reference for running the SEVIS Alerts Process in ctcLink. This process identifies information that should be submitted to SEVIS regarding new students (F/M visas) or exchange visitors (J visas) and data changes for existing students or exchange visitors. The process also verifies SEVIS business rules, required fields, and certain eligibility edits. SEVIS School Code: Input or Look Up. Validate SEVIS CIP Code: Select Yes or No. Select Yes for the alerts process to compare CIP codes against the corresponding CIP Code Table page. F Students: Enter the number of days after either the I-20 end date or the OPT end date has passed for a complete program event to appear on the Alerts page for an F-1 student (0-60). M Students:Enter the number of days after either the I-20 end date or the OPT end date has passed for a complete program event to appear on the Alerts page for an M-1 student. (0-30). Current Term: Enter or Look Up. Next Term: Enter or Look Up. As of Date: Enter date.